The Zanussi ZCV68310XA makes cooking a more enjoyable part of your life. With its multifunction oven, which combines the benefit of fan and conventional ovens and with additional functions like pizza and thermal grilling. Experiment and get the best results for all your different recipes and dishes. Auto Cook is a fully programmable timer which can cook your food and automatically switch off when you tell it to, giving you more time to relax. The ZCV68310XA has 4 Fast Ceramic zones in 2 sizes. With Catalytic liners which help to stop grease from sticking inside the oven and with dishwashable glass panes, this makes cleaning the ZCV68310XA a breeze. 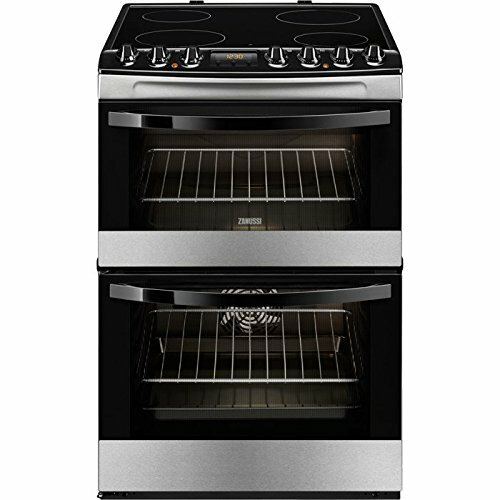 The ZCV68310XA comes with a main oven capacity of 69 litres and second top oven with 37 litre capacity, giving plenty of cooking space for the entire family. The built in Thermaflow venting system makes sure that the oven?s heat is spread throughout the oven, so food gets cooked evenly.